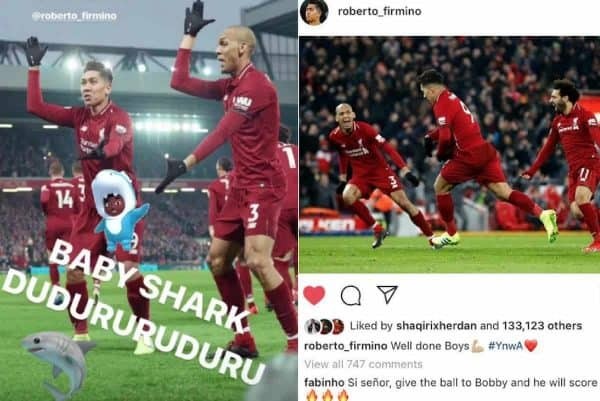 Baby shark and the Firmino song - Liverpool squad in high spirits after "massive win"
Liverpool’s squad were in high spirits after the dramatic 4-3 win over Crystal Palace as they lauded another “important three points”. Liverpool welcomed Crystal Palace to Anfield on Saturday in the knowledge that another win would maintain at least a four-point buffer at the top of the Premier League table at the conclusion of the weekend’s fixtures. While many had hoped the Reds would navigate the clash without eliciting a nervous breakdown, it would be out of character for Liverpool to do so – as the game proved. A first-half goal in the way of Crystal Palace and Andros Townsend left Liverpool with everything to do in a second term which proved both chaotic and exhilarating in equal measure. Six goals, four in favour of the Reds ensured all three points remained on Merseyside as a Mohamed Salah brace and strikes from Roberto Firmino and Sadio Mane rendered James Tomkins and Max Meyer’s conversions for the visitors worthless. A red card for James Milner put a small taint on what was a momentous result, but spirits were high in the immediate aftermath as Liverpool’s resilience and patience spoke volumes. 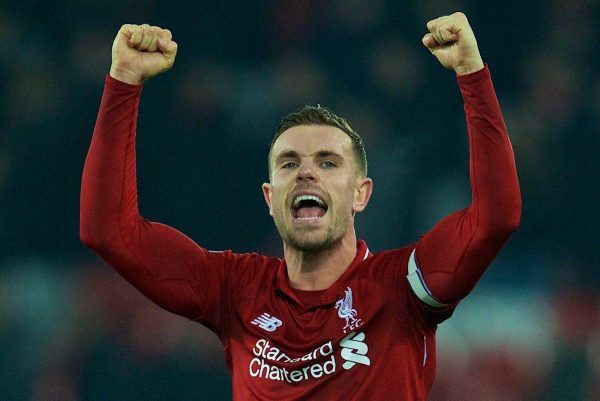 For skipper Jordan Henderson, who spoke to LFCTV after the game, it was a show of “great character” in what was a “massive win” on a night where Liverpool were not at their best. “It is [a huge win]. Every game is massive, as we know, and it’s an important three points again. “It was a tough game, not what we would want in terms of performance. I think we could have been much better in controlling but we will analyse the game, obviously, to see what we didn’t do as well but overall, we have got to be delighted again with the result. “It’s important [to find a way to win]. You’re not going to play as well as you like every single game so when you’re not flying or playing as well as you can it’s important to find a way to win and keep going right until the end, and we managed to do that. “It’ll feel like a massive win, of course, but still we need to improve. One of Liverpool goalscorers, Sadio Mane was equally pleased by the fight his side showed in getting themselves back in the game to secure, what he felt was, the biggest win of the season so far when speaking to LFCTV. “100 percent [the biggest win of the season so far]. It was not our best performance but more important for us was the three points and we got it and I think everybody is happy. “I think it’s a good sign [the fight in the team] because we can see we get better at one-nil down in a very difficult game, but we still believed and pushed hard as a team and I think we deserved the win. “To be honest I think we have experience now and of course we are confident if you are winning, but not too much because then after we know what is going to happen. The result ensured the Liverpool squad were in a joyous mood as they took to social media to celebrate, where goalscorer Roberto Firmino was the centre of attention from his Brazilian team-mates. Good job boys 3 points ????? Great comeback from the boys today #3morepoints ? 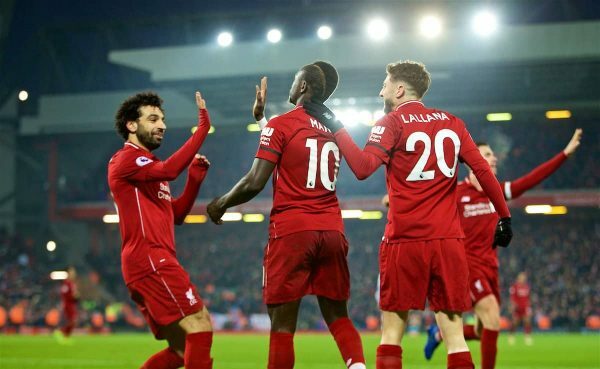 Liverpool’s latest victory saw Jurgen Klopp‘s side reach the 60-point mark after just 23 games and injects another boost of confidence to a side who are growing in stature with each passing game. A trip to Dubai now awaits, where the Reds will hope to see a number of key personnel recover from knocks and lingering injuries ahead of the clash with Leicester in 10-days time.